I had probably one of the best backpacking trips to date this past September with some friends on Flat Mountain Pond Trail in New Hampshire. We went on the last weekend of September – the weather was ~50 degrees, and the trees were starting to turn. The only downside was that it was either misting to full-on raining the entire time. Luckily, there is a lot of dead birch in the area – many felled trees, so, we were able to keep a fire going the entire time. We also had a midnight encounter with a moose – it was about 10 feet from my tent, and 5 feet from another one in our party’s tent… at 3am. Nothing like waking up to a 1500lb animal, hiding away, hoping not to scare it, and get caught in the ensuing madness. We did not camp in either of the shelters, but at the little peninsula that was on the opposite side of the pond. Absolutely beautiful hike – I cannot wait to do it again. I highly recommend it to anyone, from novice to expert, as our party had both, and in between. Easy grades, no real steep ascents, and a few technical sections, with lots of water crossings, but nothing too technical there. One note about the trail – if you are parking at the trailhead – have something with some clearance. While I used to go off-roading years ago when I had my Nissan X-Terra, which was heavily modified for off-roading and rock crawling, using those skills (and having no other choice) I was able to bring my very low clearance Saab wagon down the trail in pitch darkness with nothing more than a light scuff – I highly recommend something like an SUV to get to the parking lot at the trailhead. It’s muddy, rocky, and very rutty. I hope these resources are useful for anyone hiking or backpacking this trail. Have any other suggestions for resources on the trail? Please leave them in the comments! This entry was posted in Backpacking, Hiking, Trail Resources and tagged Backpacking, flat mountain pond, flat mountain pond trail, flat mt. 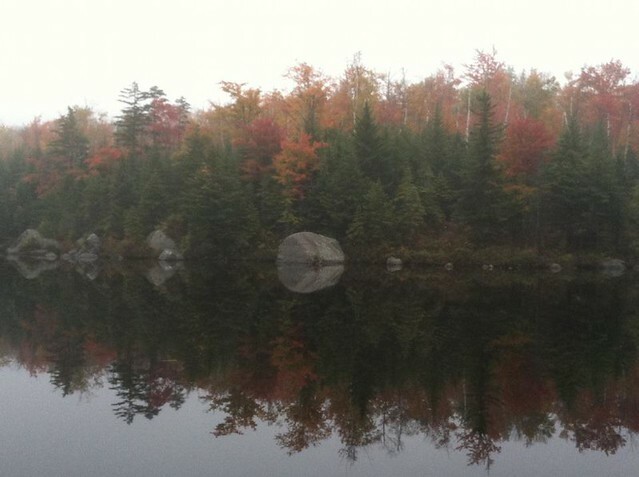 pond, flat mtn pond, Hike, Hiking, new hampshire, nh, resources, trail. Bookmark the permalink. « Winter is officially here! Do you know where your crampons are?